By modifying a Microsoft Kinect sensor, a research project at the Computer Human Interaction (CHI) conference demonstrated how gamers in a wheelchair could interact with motion games. “If we were using the Kinect SDK in the traditional way then people would be sitting in one fixed location and using their hands and arms as input,” said Kathrin Greling a Ph.D. student at the University of Saskatchewan. 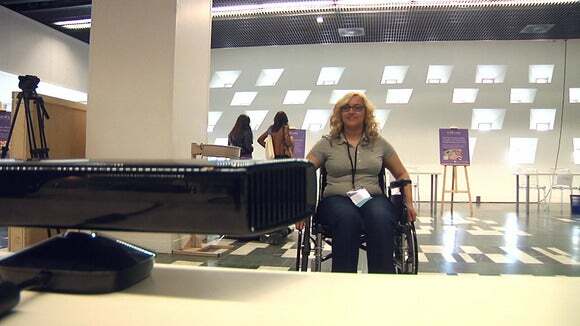 She said the modification that she made to the Kinect meant that the system could take into account the position and movement of the wheelchair. She said the research isn’t aimed at just children, but older adults too who would be able to use motion gaming as exercise. She said some wheelchair bound patients at nursing homes and other long term care facilities could benefit from the exercise and entertainment provided by gaming. Researchers demonstrate how gamers in a wheelchair can interact with motion games at the Computer Human Interaction conference. At CHI, one of the researchers sat in a wheelchair and swiveled it to the left and right to control a race car on screen. Greling said that she and her team want to explore how a wheelchair can be used in games that have been designed for people in wheelchairs rather than just games that have been modified.